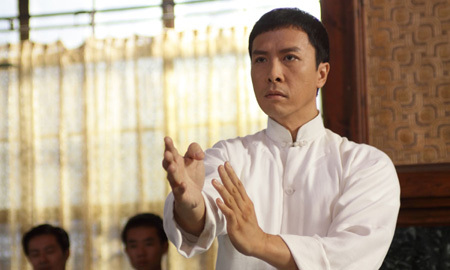 Donnie Yen returns for more "Wing Chun, Ip Man" in Ip Man 2. The Skinny: Ip Man 2 entertains during its first half thanks to Donnie Yen's charisma and Sammo Hung's action. It also entertains during its second half - but for completely the wrong reasons. A money play from Wilson Yip and Raymond Wong that sacrifices effort and authenticity for crass commercialism, ugly racism and some incredibly loud acting. Hey, the action is awesome. For some, that may be all they need. by Kozo: The Man is back - Ip Man, that is. Donnie Yen returns to the role of the famed Wing Chun master for Ip Man 2, a blockbuster sequel also directed by Wilson Yip. But for the sequel, Yip and producer Raymond Wong go beyond Ip Man's sensationalized biography into something far more fictional, and the results are unbelievable if not inadvertently humorous. The second half of Ip Man 2 is basically a blow-by-blow retread of Rocky IV, which does absolutely nothing for the film's artistic cred. But hey, Ip Man 2 has Donnie Yen and it also has fighting. Fighting and bleeding and shouting. Those three things equal quality to a great many people, so let's get out of the way and let them have some fun. All things considered, it's quite easy to enjoy Ip Man 2 - though probably not for the correct reasons. When we last left Ip Man (Donnie Yen), he'd migrated to Hong Kong along with his wife (Lynn Xiong) and son. Setting up a martial arts school on a rooftop, he earns his first student Wong Leung (super-handsome Huang Xiaoming) after demonstrating how kickass Wing Chun is. Unfortunately, the other martial arts schools, which are organized not unlike triads, aren't so excited about a new teacher in town. They challenge Ip Man to a series of duels with the other local masters, among them Lo Meng and Fung Hak-On. The biggest master of them all, both figuratively and literally, is Hung Chun-Nam (Sammo Hung), who steps into the fray when the other masters aren't able to humble Ip Man. Meanwhile, Hung Chun-Nam is under pressure from the corrupt British authorities, who collect protection money from the schools in exchange for allowing them to operate. Before long, Ip Man can't help but be pulled into that conflict too. The first half of Ip Man 2 is nothing new. Ip Man's struggle to make it in Hong Kong versus the local martial arts masters recalls his conflict with the invading martial artists in the first Ip Man in that both demonstrate Ip Man's unwavering honor versus near-thuggish martial artists. The local martial arts schools have become morally compromised, and of course it's up to Ip Man to remind them of the true spirit of Chinese martial arts. This stuff is familiar but still engaging largely due to Donnie Yen's charismatic calm and Sammo Hung's stellar fight choreography. The first big fight sequence, a factory-set throwdown featuring Ip Man and Wong Leung versus a bunch of Hung's students, is exhilarating and creative, but the highlight is the Sammo-Donnie duel. It's a fast and intense fight that excites while also clueing us in on all the characters, themes and situations. If there's one thing you should pay to see in Ip Man 2, it's that moment. Big surprise, it's Ip Man who decides to stand up for the Chinese, leading to a bloody Wing Chun versus western boxing match that's both rousing and disturbing. It's rousing thanks to Sammo Hung's action, which manages to be tense and exciting as Ip Man finds himself stymied by Mr. Twister's power and the sometimes corrupt officiating. The conflict is disturbing because the film tries to mix nationalist pride with racist, cartoonish caricatures - and frankly, this sort of storytelling just doesn't work in today's globalized media. The themes are terribly simplistic and appeal to the blind nationalist pride of a China audience, and the fact that the filmmakers are trying to profit off this sort of xenophobia is somewhat uncomfortable. There is historical basis behind the storyline, but telling it in such a lopsided fashion just feels ugly. Is complex, or even marginally more-than-shallow storytelling really that hard to handle?